I was incredibly lucky to spend some time in glorious Scotland earlier this year and in visiting the wee town of Aberfeldy, struck the proverbial chocolate goldmine! 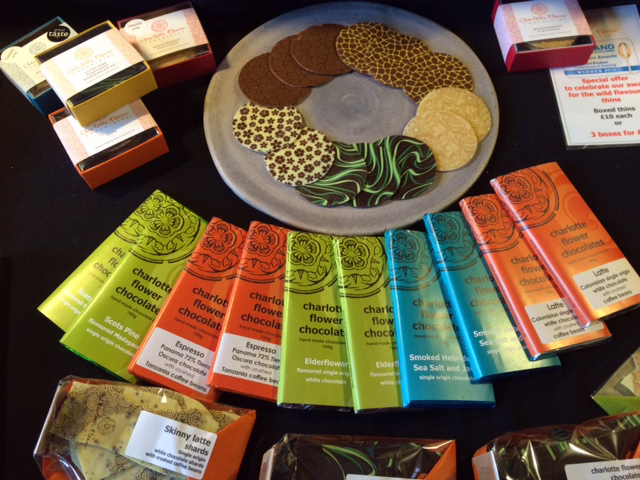 It was my great pleasure to spend some time with Charlotte of Charlotte Flower Chocolates, a wonderful chocolatier with a panache for beautifully crafted handmade chocolates, with flavors inspired by natural ingredients. She literally roams the hedgerows and landscape for local and seasonal ingredients, fruits, plants and flowers, such as elderflower, wild mint, rhubarb, meadowsweet, hazel and beech nuts, honey and roses. During our short visit, Charlotte had just received a new cocoa bean and was experimenting with roasting techniques and timing. Curious to know how she came to this line of work, we asked, and rolled up our sleeves and listened while helping a while to separate the cocoa from the warm husk shells. Charlotte shared her background of being a forester and forager by nature. After an encounter with a well-known Parisian chocolatier, she began on a journey to see how she could combine local wild flavors with high quality chocolate in uniquely Scottish ways. I’m guessing there were hiccups, albeit delicious ones, along the way! I’m not the only one who thinks these sweet creations are divine; several were celebrated by the Scotland Food and Drink Excellence Awards – including Product of the Year for her Meadowsweet Thins – and at the British heats of the International Chocolate Awards – winning the Gold Award for her Smoked Hebridean sea salt and Java Milk chocolate. Our conversation turned to sustainability, naturally, and we heard about her passion for fair trade and environmentally sound practices. I was sold. Out came my purse to take as many as I could carry with me, to share with family and friends. Late summer/early Fall is one of my favorite times of the year. I love the mix of cool, crisp days when it’s finally time to pull out your favorite boots, flannels and sweaters, and the lingering warm, summer-like days that help you ease out of your summer frame of mind. Halloween has always been one of my favorite holidays, especially because of the decorations. Instead of the typical carved pumpkins, here are a few fun twists to add to your decorations this year. I was fortunate enough to visit Eastern Europe in September with my husband, Steve. We took a 10-day riverboat cruise on the Danube River. It was our first trip to Europe and I was thrilled to have the opportunity to see the beauty of the European architecture in person that I have been so drawn to in images. I enjoyed focusing on architectural elements and applied design in my many of my photos and plan to share some of my favorites in this and future blog entries. This Entry is focused on the beautifully painted patterns on the architectural surfaces of the Matthias Church in Budapest, Hungary. The church has been beautifully re-built and restored since WWII. 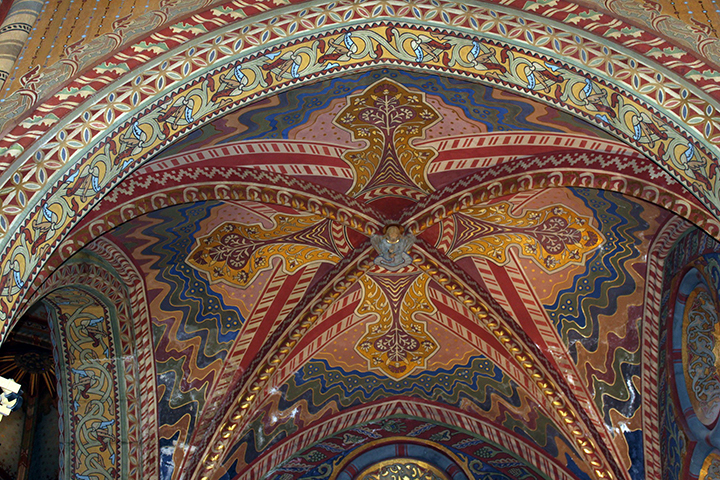 It was the first of many, many churches we visited on our trip but the richly painted designs in Matthias Church were my favorite. The rich, bright colors and changing design patterns flowed across practically every wall, ceiling, and molding whether they were flat, curved, or carved. They added depth and movement in a whimsical, playful way. I thought they were delightful and evoked such a different feeling when compared to their more serious counterparts that were filled with clouds and heavenly beings, glimmering gilded elements and stone columns carved in black and red marble. Have you heard the phrase, “those that do for others, don’t do for themselves”? Or perhaps a better example is, “The cobbler’s children had no shoes”. As a designer, those phrases have always been the case for me and my abode. Don’t get me wrong, I’ve always loved creating a home but it’s been on an extreme budget (think second hand stores (except for mattresses, I shudder at the thought) and dumpster diving), but this past May my husband and I went all in and purchased a home in town that has been worn down, and neglected for thirty plus years. When we first heard this home in our dream neighborhood was “coming soon” we immediately called our realtor and drove over to the house. It was in utter disrepair, but we were blind to the reality. . . we only saw our future home. 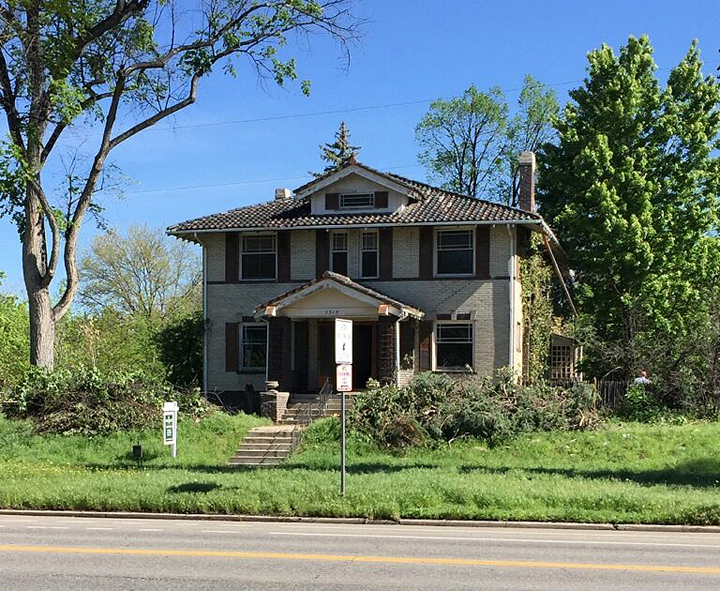 After a competitive bidding process against developers who wanted to tear down the historic home and build two new homes on the almost half acre site, we came out victorious only after promising the owner that we would renovate the home back to its original splendor. With title and keys in hand May 25, our contractor started on May 26 clearing the overgrown land and demolishing the damaged interiors. It’s already been a long journey, with many, many lessons, despite the fact I’ve been in the business for over 13 years, but it’s been a dream come true. I’m excited to share more stories from this experience in future blog posts. I hope you’ll come back to read more and to see the progress of this gem in the city!